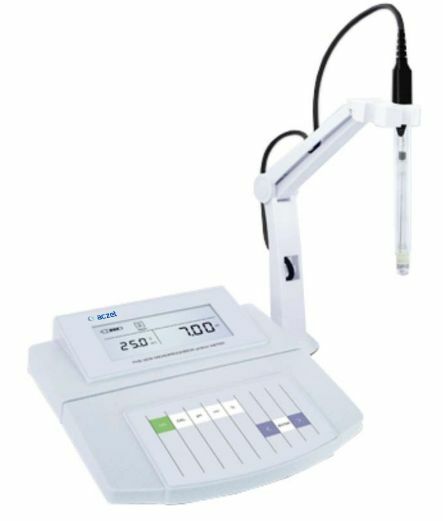 APHS-BW Series benchtop pH/mV meters includes models APHS-25CW, 3CW and 3BW for the measurement of acidity and alkalinity in liquids. Using the suppled temperature probe,the temperature value is displayed on the screen. The meters provides manual or automatic temperature compensation mode for optimum accuracy under variable temperature conditions. After calibration, the percentage slope of the electrode is displayed before the meter returns to measurement mode per the stop value, you decides whethe to change the pH electrode. The integrated plastic housing and keypad is sealed to protect against accidental spills and splashes. The electrode holder arm is rapidly switched to both sides and swivels and articulates for convenient use and positioning. During calibration, if the calibration solution does not match the meter’s indicated value, and ERROR message is displayed. The meters is capable of calibrating up to 3 points using USA or NIST pH standard buffer. Press CAL key to enter calibration mode and immerse pH electrode into indcated calibration solution, press ENTER key and meter is automatically calibrated. Temperature Probe (only for APHS 3BW) pH Buffers pouches (pH4.01/7.00/10.01) electrode Holder Arm 9V power adapters.